Looking for the best family car? It's a bit pricey, but the Tesla Model X is the family car of the future. The Tesla Model X is a technological piece of wizardry that even non-car enthusiasts can love. Tesla’s take on an SUV is luxury-priced and has high-end features along with its spectacular all-electrical engine and power storage system. The vehicle first reached the commercial market in 2015, and at around $80,000 starting price, it’s not exactly a mainstream vehicle. That’s more than twice or even three times the price of mainstream SUVs. However, Tesla was on to something when it made this high-tech marvel. The Tesla Model X is the future of family cars. Looking to get one? Be sure to use a Tesla Referral Code to get free Supercharging. Discover why this top-of-the-line SUV stands out as the best family car. Tesla catered to what modern families need in a brand-new SUV when it designed the spacious interior. 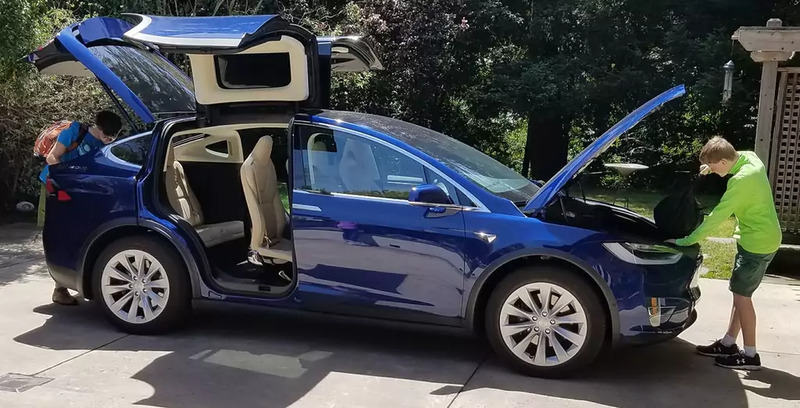 The Model X seats seven people comfortably, which comes in handy for long trips to Grandma’s house. Fold down any one of the five back seats individually to create a custom-made cargo arrangement depending on your family’s needs. The seats fold neatly into the floor. Folding down the back row gives way to copious amounts of cargo space for groceries, luggage or road trip necessities. Even more amazing, this happens electronically with the push of a button. There’s no more grunting as you try to lift seat after seat out of the SUV, nor do you have to wrangle with stray seatbelts to figure out how the seats fold down. Just push one button and the seat neatly disappears in a few seconds. The vast windshield gives you great sight lines and better views of the road in front of you. In the summer, it can get a bit hot because it lets in more sun. However, the robust air conditioning system and tinting helps reduce the effects of the sun on a hot day. The interior is just one feature kids and parents love about the future family car. And who doesn’t want a front trunk, aka where the engine normally would be, appropriately called the Tesla frunk. 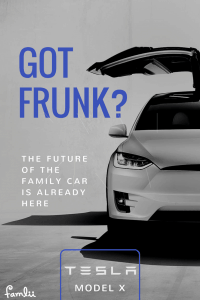 Every family needs a ‘frunk’ – the Model X ‘s spacious front-loading storage trunk. The fuel economy of this SUV is, well, unmatched. You don’t have to buy gas at all. One charge lasts up to 290 miles, which is good enough to go across many states or even several states. When you use Tesla’s travel planner, you’re never too far away from a Supercharging station when you’re on vacation. In terms of commuting, grocery shopping and soccer practices, you don’t have to waste time to gas up at a station. All you do is plug in your Model X in your garage at night. In the morning, you’re ready to go, and the electricity you use from the grid is probably cheaper than a tank full of gas. Plus, take advantage of the possibility of free Supercharging when you’re on vacation. If you have a Tesla referral code from another Tesla owner and you’ll get free Supercharging credit. The Model X has been designed with safety in mind first. Since there’s no engine, a large crumple zone in the front helps prevent injuries if something hits the front of the SUV. A bevy of airbags keeps everyone in place after a sudden impact. Heavy batteries underneath the seats make the Model X resistant to rollover crashes compared to other vehicles of its size. Radar, sonar, sensors and cameras send data to the onboard computer to avoid other vehicles and obstacles. The Autopilot function gives the computer control under certain circumstances. See the full Tesla Autopilot Review here to learn everything it can do. One unique feature is a sophisticated, medical-grade HEPA air filtration system that keeps out pollen, bacteria, pollution and viruses from the cabin. Reduce your sneezing fits during allergy season when you’re out and about. See how the Tesla HEPA filter during wildfire season – pretty amazing. Not only is this one of the safest SUVs to protect your family, it’s also one of the coolest due to its high-tech extras. The giant dashboard screen puts every aspect of the Model X at your fingertips. The 17-inch control panel works like a tablet computer. The panel lets you manage charging times and mapping software to optimize your travels, while music and video streaming keeps your kids occupied when they are restless. Control the heated seats and air conditioning from the same console. Connected features in the car also update software automatically and give you important messages from the manufacturer. The driver’s door opens automatically when you approach with your keyless entry, which is great when you have your hands full or you simply want to keep your hands warm without fumbling for keys and a door latch. Falcon-wing back doors open with a gentle tug on the recessed handles and the automatic system takes over from there. Some people find the falcon-wing doors annoying, while others find them utterly cool. At around $80,000 starting price, the ordinary American family isn’t going to buy Tesla Model X SUVs in droves anytime soon. That could very well change in the following decade. Innovation starts at the top and works its way down. Once consumers demand more and more automated features from other carmakers, the price of the Model X lowers and makes it the ideal future family car. Personal computers and laptops were once considered luxury items, and now ordinary families can buy one for $100. The Model X could turn out the same way given enough time, investment and mass production. The future family car is here in the Tesla Model X. Wait a few years and see more automakers move towards SUVs styled after the Model X design. Then prices come down and make this modern engineering marvel an ordinary, everyday item. Remember if you’re interested in purchasing one and would like free Supercharging credit (while it lasts), be sure to use a Tesla Referral Code for free Supercharging.